This new International Version includes all material covered in the standard eighth edition, but numerical data and calculations are expressed in Systeme International (SI) units. Completely revised, this latest edition includes new chapters on electrical systems; motors and drives; commissioning; and human behavior and facility energy management. Also updated are chapters on lighting, HVAC systems, web-based building automation, control systems, green buildings, and greenhouse gas management. 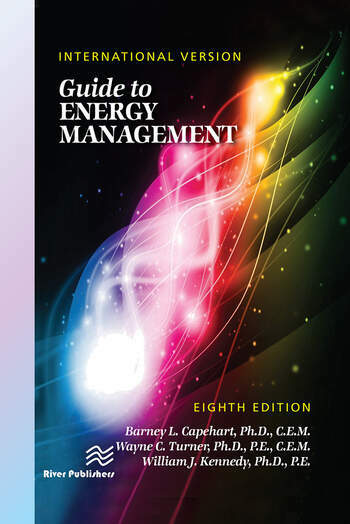 Written by respected professionals, this book examines objectives of energy management and illustrates techniques proven effective for achieving results. Introduction to Energy Management. The Energy Audit Process: An Overview. Understanding Energy Bills. Economic Analysis and Life Cycle Costing. Electrical Distribution Systems. Lighting. Electric Motors and Drives. Heating, Ventilating, and Air Conditioning. Understanding and Managing Boilers. Steam Distribution Systems. Control Systems and Computers. Energy Systems Maintenance. Insulation. Compressed Air Systems, and Process Energy Management. Renewable Energy Sources and Water Management. Distributed Generation. Web-Based Building Automation Controls and Energy Information Systems. Creating Green Buildings. Green House Gas Emissions Management. Commissioning for New and Existing Buildings. Human Behavior and Facility Energy Management. Appendices.